This set pulls its textures from my driftwood set. You must have at least the chair in your downloads folder to have a texture. All recolors also, work for this set. You have one sims hour to take care of the infant, if you do not you will get another message asking you to take care of it. Note: You must direct your sims to take care of the infants needs. 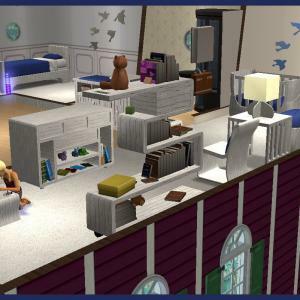 I could not get the coding to make the sims go to the infant. The bunkbeds work similar to the set by the dream team, they are not cloned from that set as it is next to impossible to clone any of those items....due to the mirror etc. I did however, use the same animations etc. I have not made a toddler bed for this set as the EA version did not have one. I may make one later. The clock is a working clock. 1st floor of the home in the video shows many of my driftwood set items, the 2nd floor shows my lullabies set. I have changed the changing table to use the fabric texture around the drawers, some images do not reflect this change. Awesome! Amazing!!! This has literally taken my breath away. You know how I love the ways you have given me more interaction with my infants. Will this conflict with the CribSleepNight mod? The Bunkbeds and Baby Monitor are incredible, a fabulous finishing touch for an incredible set. I am not familiar with the crib sleep at night, but the infant won't start crying until it wakes up, so it should not be a problem. The crib itself does not have any modification, except I made the side rail work. Wow, this is cool. Um...in that last pic, I counted 5 (gasps) children. Is that Sim the Nanny? I'm not trying to be rude or funny, but how do you take care of so many children? I go bonkers with just one and then wait for the infant to grow up a bit and be old enough to go to school before I take on the task of another child. *downloads* cause now I can since I got that compressorizer thingie! 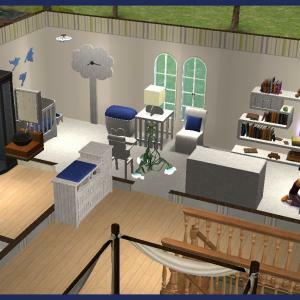 That last pic is of the Sims 3 set. Fabulous set! Thank you so much Rebecah! Which download link has the baby monitor? The download button has the baby monitor.